You went for it. Frankly, we all did. With the franks – hot dogs. And burgers. Potato salad, someone’s aunt’s best apple pie, sodas, beer, and ice cream, too. You celebrated July Fourth like most Americans. Today? Not feeling so hot. All is not lost. It’s actually pretty easy to put yesterday’s holiday bender behind you and focus forward on a healthful summer. It starts today, right now. This isn’t a detox – we think your body is aptly equipped to handle that on its own but ONLY if you’re giving it what it needs. Another full day of beers and brats and your digestive system is going to boycott the whole idea of helping you out! Stick to our July Fourth Recovery Menu and you’ll feel better throughout the day, not to mention how much more energy you’ll have to take on the rest of the weekend’s events. It’s nothing but water today. At each meal and between meals make sure you’re drinking water. This will keep optimal digestion happening, flush the toxins from yesterday, and help you feel refreshed and energetic. You can even hydrate with water-rich fruits like watermelon, cantaloupe, and grapes, which make tasty hot-weather snacks. And if plain water isn’t doing it for you, our nutrition expert Mary Hartley, RD recommends seltzer water mixed with 100% juice or blackberry mint iced tea! Try this fresh classic, the Chobani Blood Orange Smoothie made with avocados, spinach, banana, berries, and Greek yogurt. Or, this Green Tea Smoothie is a vegan option with an incredible vanilla cake-like flavor; recipe available in our Baker’s Dozen eCookbook. No time to go all the way with the smoothie? A bowl of yogurt with a variety of fresh berries will also do the trick. Wake up with a jog, yoga, swim, or ride on the bike to charge your body and let it know you’re right back on track today. Go for something like Jessica Smith’s HIIT At-Home Workout to really break a toxin-releasing sweat. 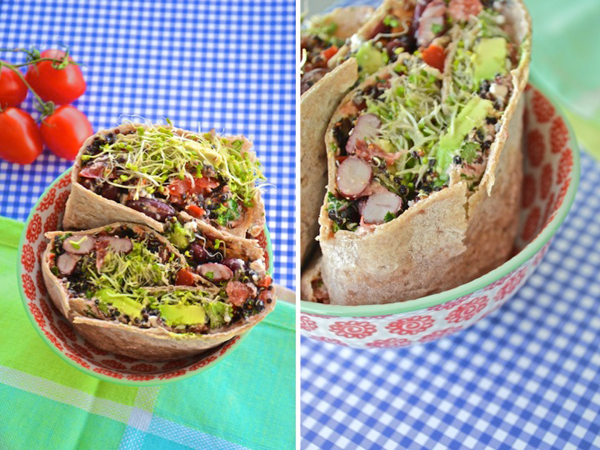 We’re obsessed with these Vegetarian Summer Wraps at Como Come Cami, filled with avocado and sprouts, orange quinoa with beans, and cherry tomato goat cheese spread. Another hearty veggie lunch dish would be Tabouleh, which includes parsley, a natural diuretic that helps your body release toxins. Stick to as many plant-based foods as possible for really simple, clean eating that’s super satisfying. A simple grilled salmon topped with a bit of fresh lemon and cracked pepper is still perfectly acceptable for grilling at the lake. Add Grilled Balsamic Veggies and brown rice cooked in vegetable broth for more flavor. Other side options include our Avocado Serrano Coleslaw or a blackberry spinach salad. If salmon isn’t your dish, try grilled portabella mushroom “burgers” or chicken and veggie kabobs. We like a hunk of watermelon after a simple summer meal. It’s hydrating, sweet, and very satisfying. If that’s not going to do it for you, try one-ingredient frozen banana ice cream.